Here's to a brand new month! Have a great weekend, everybody. See you in April! I can't lie... 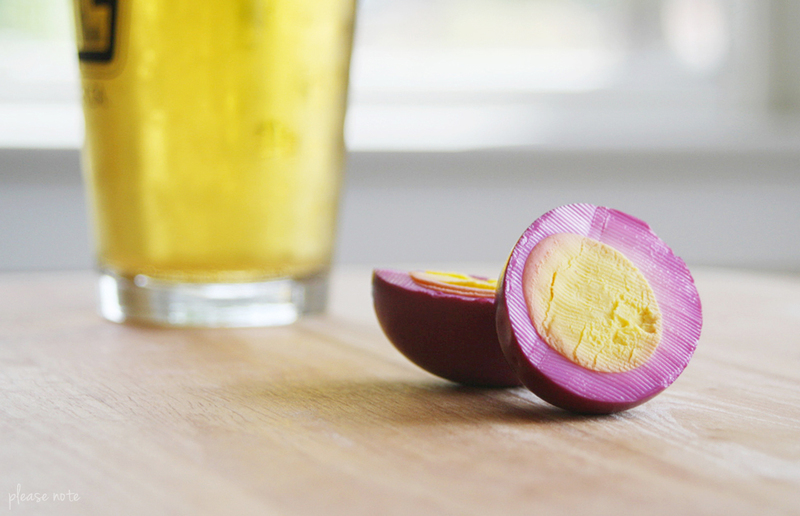 I love pickled eggs, and I REALLY love a pickled egg with a nice cold beer. Talk about a match made in heaven. Anyway, about a year ago I posted this spicy pickled egg recipe, so I thought it was time to show you a completely different version. My grandpa used to make these purple pickled eggs all the time when I was a kid and I was always so intrigued by the color. If you're from LA, or have ever visited Philippe's, you might be familiar with these. I can honestly say I've never eaten at Philippe's without ordering one of these babies. They're just too good! As you can probably tell, this is one of those "a little bit of this, a little bit of that" recipes. 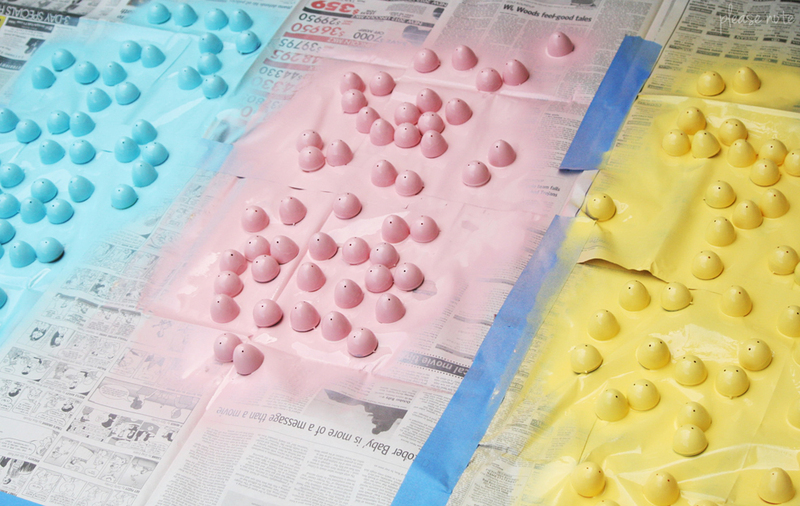 To be quite honest, it's pretty hard to screw up pickled eggs. Shell the hardboiled eggs and place them in a large jar. If you're feeling adventurous, you can actually heat up the liquid mixture before pouring it over the eggs. Let the jar sit in your fridge for about a week. Enjoy with a nice cold beer! I'm posting today in the hopes of getting a little feedback. I've been seeing a lot of 'vlogs' popping up lately and I just love them. If you're not familiar with the term, it's basically a video blog post. I think I love them because I'm always so curious as to what fellow bloggers sound like. After all, you can only get so much from text. So, what are your thoughts on vlogging? Have you ever done one? Also, if I was to post one (which I definitely intend to at some point) do you have any questions for me? I'd love to do a Q&A. 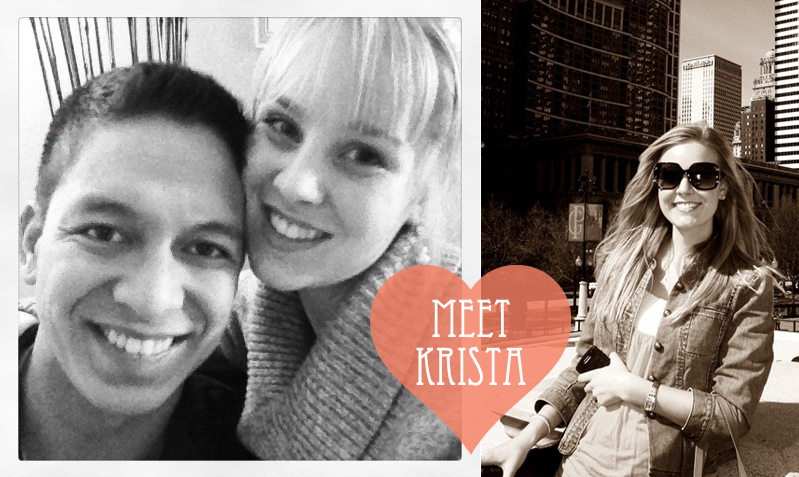 I'm starting a brand new feature here on the blog! I've decided to start doing "shop tours" of cute local shops. 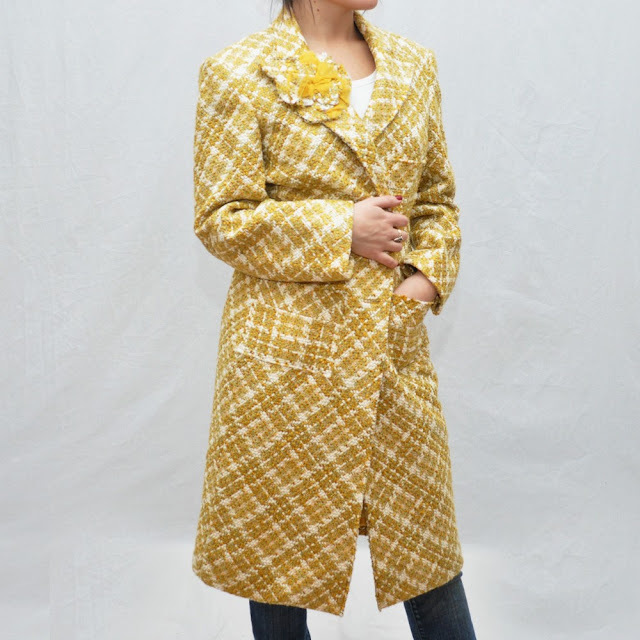 Today we're going to take a look at Bella Cosa Boutique. 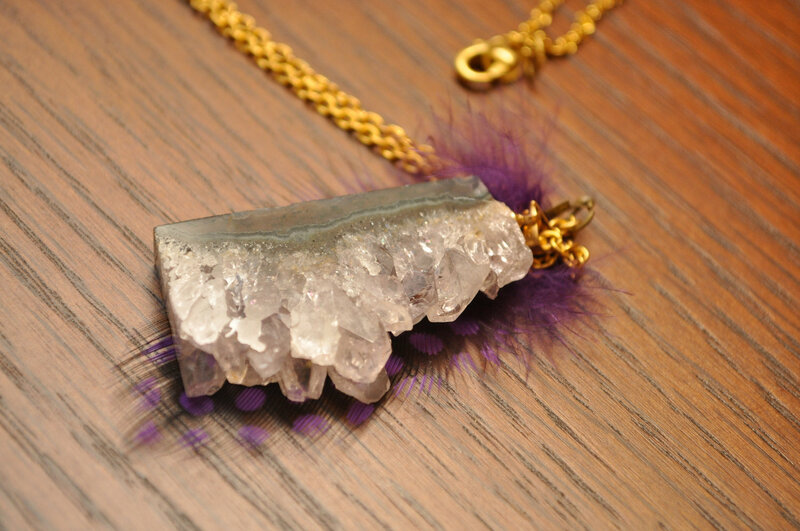 Specializing in locally hand-made items, Bella Cosa is like Etsy come to life! This awesome eco-friendly shop also offers classes! 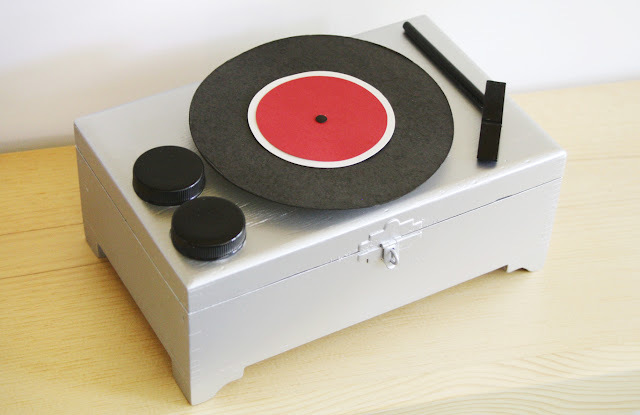 What more could a handmade enthusiast ask for? Learn more about Bella Cosa here and stay tuned for more shop tours! 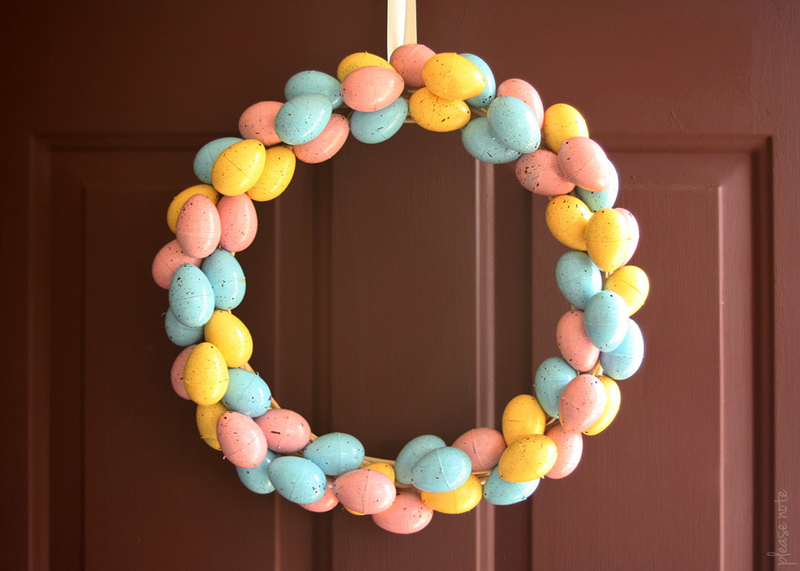 Open your eggs and spray paint both sides. To add the speckled look, dip a toothbrush in brown paint and flick the paint onto the eggs. 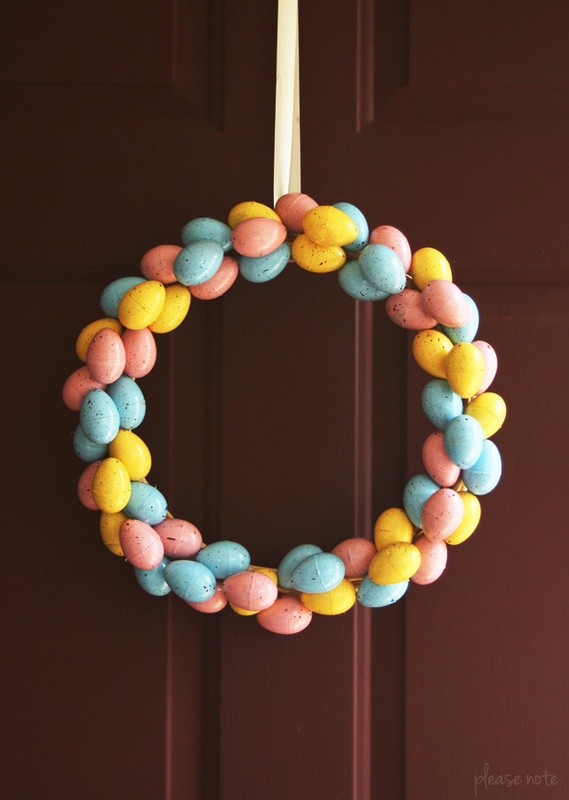 Hot glue the eggs to the wreath. Last weekend I made curtains. Ok... I made one curtain... but isn't it a nice pattern? My favorite part about this photo is that I took it after work one day this week. I'm loving this time change. I love coming home when it's still light out, and it's only going to get better! I've been craving pancakes lately (especially interesting flavors) and these carrot cake pancakes from Smitten Kitchen look delicious. These crepe paper flowers from Honestly WTF are definitely on my to do list. I'll admit, ever since I started following Pamplemousse1983, I've just loved Margaux Mondays. This kid is too freaking cute. Thank you to Heather from A Thousand Hellos for recommending Maryam's awesome blog! I've never considered adding sea salt to chocolate chip cookies but after seeing this recipe on Design Sponge, I'm going to have to give it a try. This paint dipped chopsticks DIY from Poppytalk has inspired me to find some items around the apartment that could use a little color. Maybe I'll start with something small like pencils and move my way up to silverware! Last but definitely not least, I have to announce the winner of the custom header giveaway sponsored by Erin Flynn of Eef Etcetera! Congrats Jules! I'll be contacting you shortly! So, I'll admit, my absolute favorite mixed drink is a bloody mary (here's my favorite recipe) but over the weekend I wanted to try something different (and simple). This drink is just that. 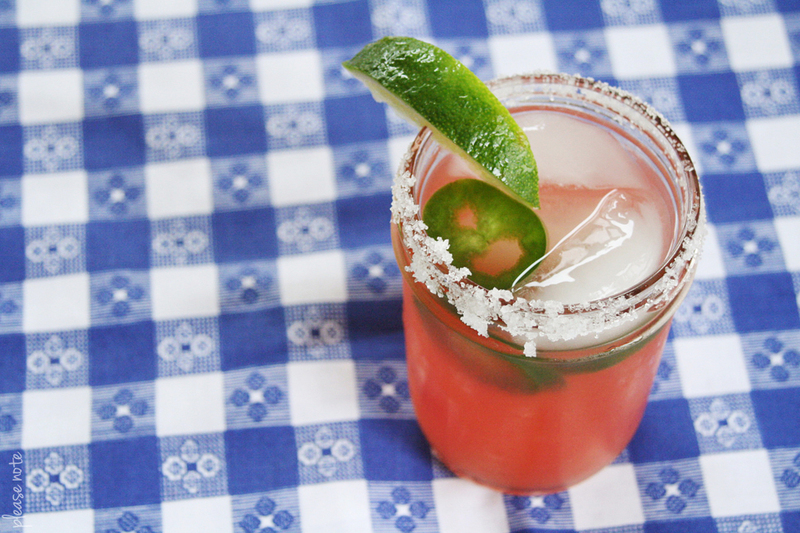 If you're a fan of sweet AND spicy drinks, this is right up your alley. Slice your jalapenos and let them soak in the tequila for a bit. Mix the jalapeno tequila mixture with some grapefruit juice (obviously, the amount depends on how strong you want the drink). 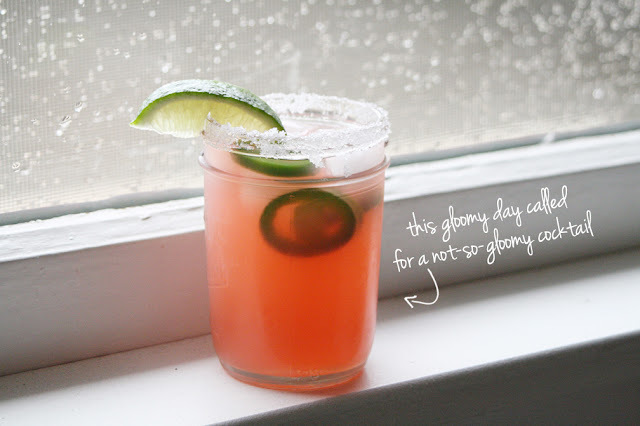 Add a little lime and pour into a salt rimmed glass. Enjoy! Sponsor Please Note in April ! Interested in sponsoring Please Note in April? I'd love to spend the month with you! To learn more, please visit the sponsor info page! 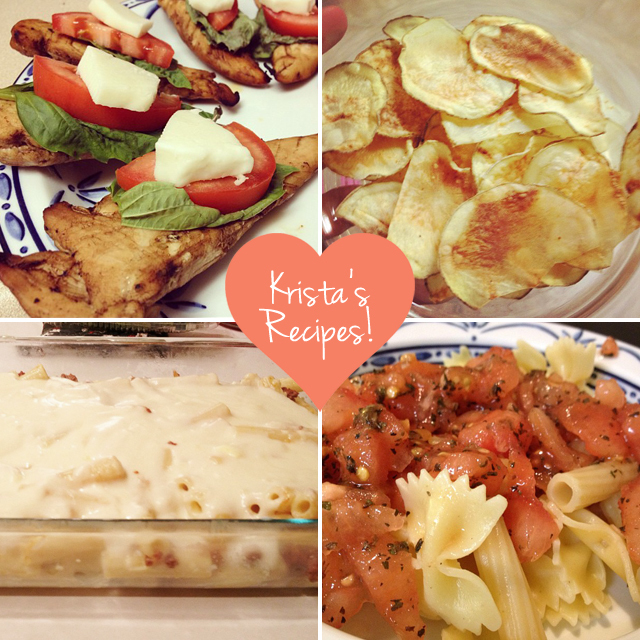 Hello, my name is Krista and I blog over at Crescendo! I am a twenty something who just moved to a new city to begin a career, girl in a current long distance relationship, member of a loving family and friend of some amazing people. Blogging began as a way to keep in touch as I moved to a new place. 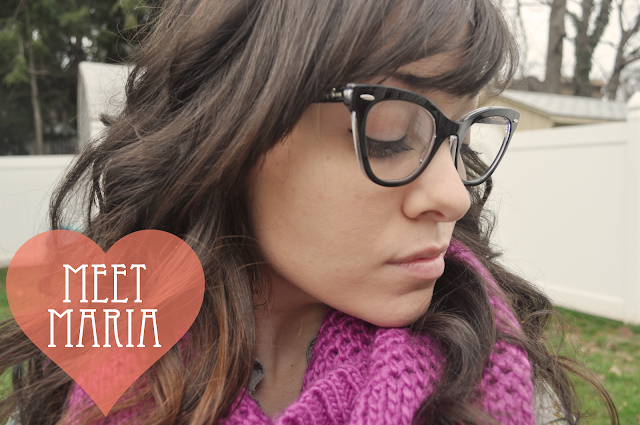 At the end of 2011, I was so inspired by a few blogs I began to jump into my blog more. It has now evolved as a therapeutic, creative outlet. I blog about anything going on in my life. 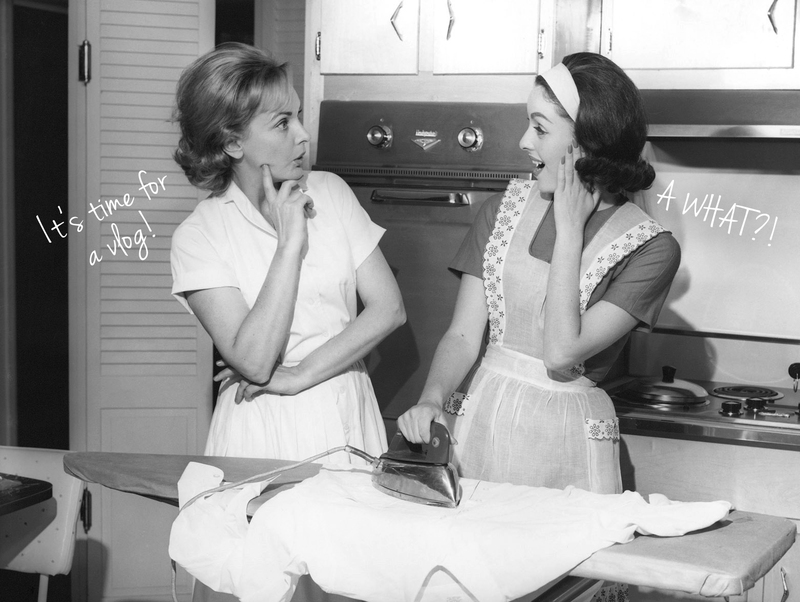 I’ve started to focus it on setting goals, organization, a personal recipe tracker, way to support working women and fun hairstyles that are easy to achieve. Overall, I blog about my life; what inspires me and the beauty I find in every day. I love discovering new blogs and meeting everyone in the blogosphere – it’s been a great adventure so far! I hope you all have a fantastic March - don't forget to stop on over and say 'hello' at Crescendo! marinated chicken. homemade potato chips. basil tomato pasta. pastitsio. Upon reading this post via A Beautiful Mess, I was inspired to try a little jewelry box makeover of my own. I thought about repainting it and adding polka dots or stripes but I wanted to do something a little out of the ordinary. 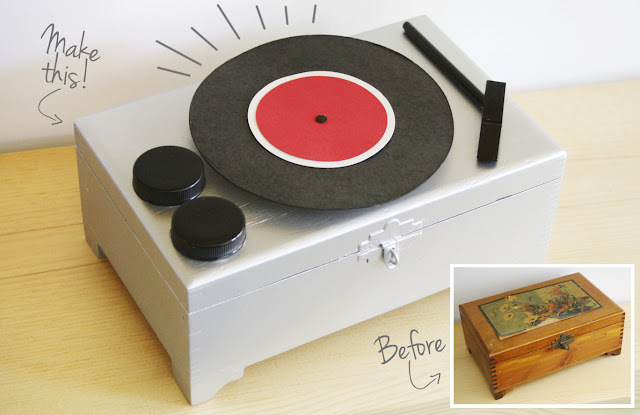 That's when I came up with this record player idea! 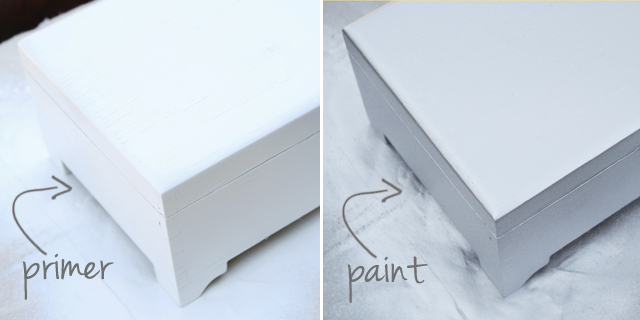 Sand the rough parts of your box before painting. 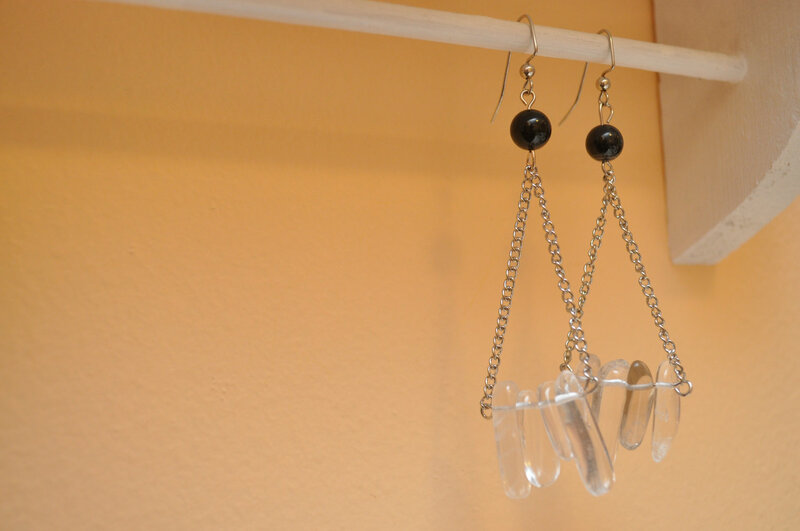 Depending on what your jewelry box looks like, this step might not be necessary. 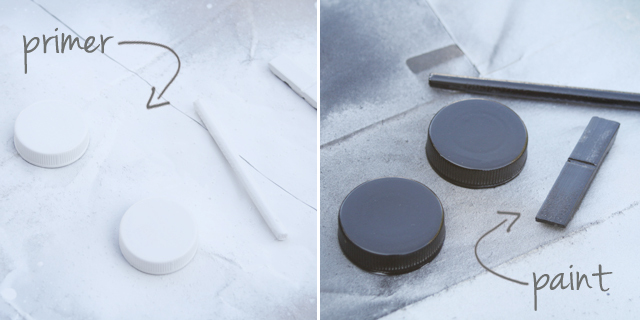 Primer and then spray paint the box the color of your choice. I chose silver. Decide what items you will use for the top. I chose to use items from around my house, including: half of a clothespin, a wooden dowel, half of a ribbon spool, and a couple of prescription bottle caps. Primer and spray paint these items. I chose to paint them black. Once your ribbon spool is dry, add construction paper circles using glue to make it look like a record. I used a tiny black paper circle from a hole punch for the center. Hot glue everything to the top of your box and you're all set! I am a tiny little girl who loves everything vintage. 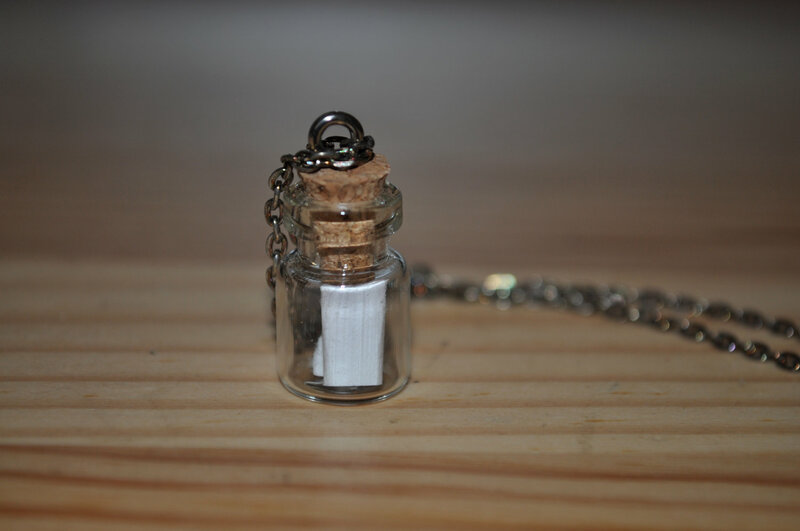 I blog over at little tree, and spend most of my days filling my shop with goodies. I started my blog because I needed a creative outlet, and I never realized how important it would become to me. I started loving vintage at a young age when my Mom would share all of her beautiful vintage jewelry & clothing with me. So you can say that I have pretty much loved vintage all my life. In my etsy shop I sell vintage, but I also make my own jewelry. I really enjoy putting things together, and making it myself...Although I don't do as much of this as I would like, it's still a huge hobby of mine that I would love to pursue full time if I had the right opportunity. Ultimately I would love to one day own a brick & mortar shop, but for now my 9-5 is spent as a Child Life Specialist on an inpatient unit in a hospital. Use discount code PLEASENOTE15 to receive 15% off of any item in Maria's shop!